tournament, which will be held for the 125th and last time in 2013. It was a bittersweet year in Northern California tennis. Officials announced that the second-oldest tennis tournament in the United States will leave after 2013, and a legend died at 76. But two former Stanford All-Americans, who happen to be twins, tied an all-time record and won an Olympic gold medal. 1. Bay Area to lose SAP Open -- Northern California fans suffered a crushing blow when it was announced that next February's SAP Open will be the last after 125 years. Rio de Janeiro, the site of the 2016 Summer Olympics and a co-host of the 2014 World Cup soccer tournament, will replace San Jose on the ATP World Tour calendar beginning in 2014. Past champions include legends Don Budge, Jack Kramer, Rod Laver, Arthur Ashe, Jimmy Connors, John McEnroe, Pete Sampras and Andre Agassi. But the tournament has struggled to attract top players and big crowds in recent years. 2. Bryans tie Newcombe-Roche -- Bob and Mike Bryan won the U.S. Open for their 12th Grand Slam men's doubles title, tying the all-time record of Australians John Newcombe and Tony Roche. The 34-year-old sons of longtime Sacramento Capitals coach Wayne Bryan have won five Australian Opens, four U.S. Opens, two Wimbledons and one French Open. And they easily could play another five years. 3. Bryans win Olympic gold -- The Bryans earned their first Olympic gold medal, the only significant men's doubles honor to have eluded them, in London. They took the bronze medal in the 2008 Beijing Games. 4. MacKay dies -- Barry MacKay, a Northern California legend, died in San Francisco after a long illness. MacKay left an indelible mark as a player, tournament director, promoter and commentator. Nicknamed "The Bear," he was among the friendliest and best-liked members of the tennis community. 5. Serena repeats -- Top-seeded Serena Williams saved a set point and beat lucky loser CoCo Vandeweghe 7-5, 6-3 to win the Bank of the West Classic at Stanford for the second straight year. It was the first all-American final on the WTA tour in the United States since Lindsay Davenport routed Williams 6-1, 6-3 in Los Angeles eight years ago. 6. Raonic repeats -- Dropping only four points on his serve, third-seeded Milos Raonic of Canada wore down unseeded Denis Istomin of Uzbekistan 7-6 (3), 6-2 in San Jose for his second consecutive SAP Open title. The 6-foot-5 Raonic won 28 of 31 points, including 17 straight, on his serve in the first set and 16 of 17 in the second set. He never surrendered more than one point in a service game. 7. Ex-Capitals among top 100 players ever -- Tennis Channel's list of the top 100 players of all time included three ex-Capitals: No. 12 Agassi, No. 43 Lindsay Davenport and No. 100 Michael Chang. The top 10 in the rankings, chosen by an international panel of experts, were Roger Federer, Laver, Steffi Graf, Martina Navratilova, Sampras, Rafael Nadal, Bjorn Borg, Margaret Court, Chris Evert and Billie Jean King. doubles title of his career with Xavier Malisse, left, of Belgium in the SAP Open. 8. Knowles retires -- The longtime Capital retired from the ATP World Tour just before his 41st birthday with 55 men's doubles titles, fourth among active players and tied for 15th in the Open Era (since 1968). The Bahamas native won three Grand Slam crowns in men's doubles and one in mixed doubles. He reached No. 1 in the world in men's doubles in 2002 and 2004. 9. Gibbs sweeps NCAA titles -- Stanford sophomore Nicole Gibbs became the first woman to sweep the NCAA singles and doubles titles in 17 years and the first Cardinal woman to do it in 27 years. Gibbs, seeded third, outlasted doubles partner Mallory Burdette, seeded fifth, 2-6, 7-6 (5), 6-3 in Athens, Ga., after trailing 4-1 and 5-2 in the second set. Then, in a match moved indoors because of rain, second-seeded Burdette and Gibbs defeated unseeded Nadja Gilchrist and Chelsey Gullickson of host Georgia 6-2, 6-4. 10. McDonald wins Easter Bowl -- After sitting out for eight months last year with a blood disorder, Mackenzie McDonald of Piedmont won the boys 18 singles title at the prestigious Easter Bowl in the Palm Springs suburb of Rancho Mirage. McDonald, seeded third, beat No. 4 Alexios Halebian of Glendale in the Los Angeles area 6-4, 6-1 for his second singles title in the tournament. He also won the singles title in the 14s three years ago. McDonald will be a freshman at UCLA next fall. Maria Sanchez of Modesto won the inaugural Gold River Women's Challenger in the Sacramento area. lost to Andre Agassi in one of the greatest matches in U.S.
For James Blake, it was one of the two most memorable matches of his career. For Benjamin Becker, it was perhaps the most-hyped match he has ever played. The top two seeds in October's $100,000 RelyAid Natomas Challenger in Sacramento are in the twilight of their careers, but they will always be linked to Andre Agassi. Both Blake and Becker were 25 when they faced Agassi in career-defining encounters at Arthur Ashe Stadium in the U.S. Open. Agassi was 35 and 36, respectively. Each match was played in front of almost 24,000 fans and a national television audience. Blake, a wild card, lost in a weeknight epic. Becker, a qualifier, won in a Labor Day matinee. Both players had mixed feelings afterward. In one of the greatest matches in U.S. Open history, Blake lost to the seventh-seeded Agassi 3-6, 3-6, 6-3, 6-3, 7-6 (6) in an All-American quarterfinal in 2005. One year later, Germany's Becker ended the unseeded Agassi's legendary career with a 7-5, 6-7 (4), 6-4, 7-5 triumph in the third round. San Francisco Chronicle columnist Bruce Jenkins covered the Agassi-Blake battle and wrote: "The people wanted neon, fireworks and memories, all of which they got, three times over. Many points were immediately preceded by thunderous standing ovations. There were so many astonishing shots, from both men, they could not possibly be recounted here." Blake was coming back from a nightmarish 2004. He broke his neck when he slipped on a wet clay court chasing a drop shot during practice in Rome and hit his head on the net post. His father died two months later. Then he developed zoster, a viral disease often caused by stress that temporarily paralyzed the left side of his face and affected his balance. Blake rebounded to earn the ATP World Tour Comeback Player of the Year award in 2005. Blake served for the match against Agassi at 5-4 in the fifth set, but Agassi broke back with the help of two crushing returns. Agassi, playing in his 20th straight U.S. Open, was extended to a fifth-set tiebreaker in the tournament for the first time. After 2 hours, 51 minutes, he converted his second match point at 1:09 a.m.
"It couldn't have been more fun to lose," Blake told Agassi as they embraced at the net amid a long standing ovation in the still-packed stadium. "For 20,000 people to still be here, I wasn't the winner; tennis was," Agassi, the 1994 and 1999 U.S. Open champion and oldest man to reach the semifinals there since Jimmy Connors in 1991, told the crowd. "I don't know if I've ever felt this good here before." Blake, who will turn 33 on Dec. 28, won the Sacramento Challenger as the second seed. During the tournament, he was asked if the Agassi showdown was the most memorable match of his career. "Probably," Blake replied. "Either that one or the Davis Cup match were we won (the title) in Portland (Ore.). I beat (Russia's Mikhail) Youzhny in three tiebreakers. They're both pretty memorable." Blake outlasted Youzhny 6-3, 7-6 (4), 6-7 (3), 7-6 (3) to give the United States a 2-0 lead in the best-of-five Davis Cup final in 2007. The U.S. went on to defeat Russia 4-1 and end a 12-year Davis Cup title drought, the Americans' longest since the prestigious competition began in 1900. The U.S., which has won a record 32 Davis Cup championships, has not won the Cup since 2007. Blake most remembers the match point he saved against Agassi. "I hit a forehand inside in that he actually wrote about in his book ('Open,' published in 2009)," Blake said. "He said it was (10) feet from anywhere he thought I had a chance of going with that ball. ... I'm going to take my rips. I've practiced it a million times, so I might as well go for it now." But Agassi promptly closed out the match. He dispatched another American, Robby Ginepri, in the semifinals before losing to Roger Federer in four sets in the last Grand Slam final of Agassi's career. Blake, who climbed to a career-high No. 4 in the world in 2006, also reached the quarterfinals of the U.S. Open that year and the Australian Open in 2008. But Blake, now ranked No. 127, has never gone further in a Grand Slam tournament. Naturally, Agassi also wrote in his book about facing Becker, the 2004 NCAA singles champion from Baylor in Waco, Texas. Agassi, who was born with one vertebra out of alignment, was wracked by back pain at the time. "Thirty minutes before the match," Agassi wrote, "I get an anti-inflammatory injection, but it's different from the cortisone. Less effective. Against my third-round opponent, Benjamin Becker, I'm barely able to remain standing. "I look at the scoreboard. I shake my head. I ask myself over and over, How is it possible that my final opponent is a guy named B. Becker? I told (my coach, Darren Cahill) earlier this year that I wanted to go out against somebody I like and respect, or else against somebody I don't know. "And so I get the latter." Becker, who's not related to countryman and Hall of Famer Boris Becker, lost to Daniel Kosakowski, a 20-year-old wild card from the Los Angeles area, in the first round of the Sacramento Challenger. Becker was still recovering from a torn groin muscle. He said later in the week that the Agassi encounter was not the most memorable match of his career. But it's up there. "The most memorable was when I won my only title (on grass in s'Hertogenbosch, Netherlands, in 2009) because I felt it was a bigger achievement than beating Agassi, who obviously was not at his best. "It was my first time (in the) U.S. Open and first time on center court, Arthur Ashe (Stadium), in front of so many people. It was maybe the most hyped match I've ever played," said Becker, 31. The matchup featured two players under 6 feet, a rarity in men's professional tennis. Agassi was listed at 5-11 (180 centimeters) and 177 pounds (80 kilograms) and Becker at 5-10 (178 cm) and 158 pounds (72 kg). Despite the hype, Becker said the match wasn't difficult to play. "I had nothing to lose," he explained. "I knew I had a chance. I knew I was playing well because I went through qualifying, I won two (main-draw) matches, I felt good about myself, I was confident, I was still young, I just came from college. "I enjoyed it. I really just focused on the match. I had no distractions from the crowd or who I was playing. Obviously, I was nervous at the beginning. It wasn't as tough as maybe afterward, trying to play the tournament after you beat Agassi (with) the big hype and media attention I had." Andy Roddick, the ninth seed and 2003 U.S. Open champion, dismissed Becker 6-3, 6-4, 6-3 in 95 minutes the next day. "I was so tired," Becker recalled. "I had maybe 2 1/2 hours of media (after beating Agassi), and obviously we played maybe three hours (actually 3 hours, 1 minute), and I had maybe less than 24 hours to prepare for the Roddick match. Obviously, he was way too good, so I had no chance." Becker admitted harboring mixed feelings about beating Agassi. As a junior, Becker idolized Boris Becker and Agassi. "It was tough to accept that I deserved to be the one that finishes his big career because I was just a kid coming from college ranked a hundred something (actually No. 112)," Becker said. "So I felt a little bit bad, obviously. As a fan, I would be pissed at myself to think that I was the guy. It would be maybe more appropriate for Roddick to do it, but that's how it was. I just wanted to win the tennis match. That's how I looked at it. I didn't want to beat Agassi -- I just wanted to win the tennis match." Becker went on to reach a career-high No. 38 in 2007, but the right-hander has dropped to No. 65 after undergoing two operations on his left elbow last year. He is 1-5 at the U.S. Open since 2006. Feb. 1-3, 2013 -- Davis Cup, first round, United States vs. Brazil in Jacksonville, Fla., www.daviscup.com. Two more American stars, both with Northern California ties, entered the SAP Open. San Francisco native Sam Querrey and Mardy Fish, both of whom played part-time for the Sacramento Capitals of World TeamTennis this season, committed to the Feb. 11-17 tournament at HP Pavilion in San Jose, Calif., organizers announced Wednesday. It will be the 125th and last SAP Open. The second-oldest tournament in the United States will be replaced on the calendar by Rio de Janeiro beginning in 2014. The demise of the SAP Open and move of the Farmers Classic in Los Angeles to Bogota, Colombia, beginning next year will leave California with only the popular BNP Paribas Open in Indian Wells on the ATP World Tour. The women's tour has Indian Wells, Stanford in the San Francisco Bay Area and Carlsbad in the San Diego region. The addition of the 22nd-ranked Querrey and No. 27 Fish gives the SAP Open the top three Americans. They will join No. 14 John Isner. Also entered are two-time defending champion Milos Raonic of Canada, No. 18 Alexandr Dolgopolov of Ukraine, past SAP Open champions Lleyton Hewitt (2002) of Australia and Fernando Verdasco (2010) of Spain, and reigning Olympic men's doubles gold medalists Bob and Mike Bryan of the United States. The 6-foot-6 Querrey, 25, will play in the SAP Open for the eighth straight year. He reached the 2010 semifinals -- losing to Andy Roddick 2-6, 7-6 (5), 7-6 (4) -- and 2009 quarterfinals and won the 2010 doubles title with Fish. However, Querrey has lost in the first round of singles for the past two years. Fish, who has battled a heart problem since last spring, plans to end a 5 1/2-month layoff in San Jose. He has been sidelined since defaulting a fourth-round match against Roger Federer in the U.S. Open in early September. Fish, who will turn 31 on Sunday, advanced to the singles final at San Jose in 2004 (losing to his close friend Roddick) and 2009 (falling to Radek Stepanek) and won the doubles title in 2004 (with James Blake) in addition to 2010. Ticket packages and group tickets for the SAP Open are available by calling (408) ACE-2121. Individual session tickets will go on sale in January. For more information, visit www.sapopentennis.com. Want to play in a Sacramento-area league for as little as $8 a season? The Sacramento Area Tennis Association (SATA) might be for you. SATA was founded more than 60 years ago as a non-profit organization to promote the sport in the region. Its membership include 29 private clubs and parks within 40 miles of the State Capitol. About 3,000 tennis enthusiasts regularly participate in SATA leagues, tournaments and tennis-related events throughout the year, according to president Carol Rose. Clubs and public parks pay $75 a year to join SATA. Participants must be club or park members, and teams pay $80 per season. "If there are 10 players, that's $8 apiece," Rose said. "There are five to eight matches per season. It's pretty cheap entertainment." Rose noted that a one-year adult membership to the USTA costs $44 (three-year and five-year memberships are discounted) and that total fees per player, including team costs, "can easily be $100 a year." She also cited less travel and most consistent scheduling as advantages of SATA over the USTA. SATA participants travel no more than 40 miles from the Capitol and play on the same night each week, except during the winter flex season. "In USTA, they say, 'You have to play within this week,' " Rose said. One disadvantage, Rose said, is that "teams can go further in USTA. There are no sections in SATA. Some people like that. Sections means traveling, which gets to be expensive." Also, most tournaments require USTA membership. Rose said SATA probably will not offer tournaments next year because of insufficient interest. SATA isn't just for adults. The Junior Grand Prix offers tournaments for boys and girls 10 through 18, and standings are compiled. "It's an opportunity for kids just getting started to play competitively," Rose said. SATA participants, Rose added, donate used equipment and clothing to needy high schools and hit with their players. For more information on SATA, visit www.sactennis.org. Top-ranked American John Isner will return to the SAP Open in San Jose, Calif., after a four-year absence. Tournament officials announced the entries of Isner, ranked 14th, and No. 18 Alexandr Dolgopolov of Ukraine on Wednesday. The SAP Open, the second-oldest tournament in the United States, will be played for the 125th and last time Feb. 11-17 at HP Pavilion. Rio de Janeiro will replace San Jose on the calendar beginning in 2014. Isner and Dolgopolov will join two-time defending champion Milos Raonic of Canada, former SAP Open champions Lleyton Hewitt (2002) of Australia and Fernando Verdasco (2010) of Spain, and reigning Olympic men's doubles gold medalists Bob and Mike Bryan. As was the case this year, the tournament will have no top-10 singles players (unless one or more accepts a late wild card). It had one in 2011 (No. 9 Verdasco), one in 2010 (No. 7 Andy Roddick) and two in 2009 (No. 6 Roddick and No. 7 Juan Martin del Potro). The last top-five player to enter was No. 4 Roddick in 2007. Roddick, a three-time SAP Open champion (2004, 2005 and 2008), retired in September, one week after his 30th birthday. Europeans Roger Federer, Novak Djokovic and Rafael Nadal have never played in the SAP Open, which is played the same week as a much richer tournament in Rotterdam. Andy Murray, who won his first Grand Slam title in September at the U.S. Open, has not played in the SAP Open since winning the 2006 and 2007 titles at 18 and 19 years old. The inability to attact any of the Big Four and the lack of a American star amid Roddick's decline since 2008 are big reasons for the tournament's impending demise. Isner, 6-foot-9, has played in the SAP Open twice. He fell to Guillermo Garcia-Lopez of Spain 7-6, (4), 6-7 (1), 7-6 (11) in the 2008 quarterfinals and to countryman Mardy Fish 6-2, 6-7 (4), 7-5 in second round in 2009. A 27-year-old native of Greensboro, N.C., living in Tampa, Fla., Isner turned pro in 2007 after being named an All-American for all four years at the University of Georgia. He has won five career singles titles: Winston-Salem, N.C., on hardcourt and Newport, R.I., on grass for the past two years each and Auckland on hardcourt in 2010. His reached the quarterfinals of the 2011 U.S. Open for his best Grand Slam result and climbed to a career-high No. 9 last April. Dolgopolov, 24, will make his SAP Open debut. The 5-foot-11 veteran has won two career singles titles, Umag on clay in 2011 and Washington on hardcourt this past summer, and he advanced to the quarterfinals of the 2011 Australian Open. Andre Agassi defeated John McEnroe 8-3 to win the Champions Showdown on Friday night at HP Pavilion in San Jose, Calif.
Agassi, 42, moved from eighth to fifth in the PowerShares Series standings with three events remaining. In the semifinals of the one-night, four-player event, Agassi topped Jim Courier 6-3, and McEnroe downed Todd Martin 6-3. Standings: 1. Courier, 1,400 points; 2. McEnroe, 1,200; 3. Pete Sampras, 1,100; 4. Patrick Rafter, 800; 5. Agassi, 500; 6. Michael Chang and Ivan Lendl, 200; 8. Martin and Mats Wilander, 200. Several changes are planned for the second annual FSP Gold River Women's Challenger, tournament director Michael Burchett said recently. 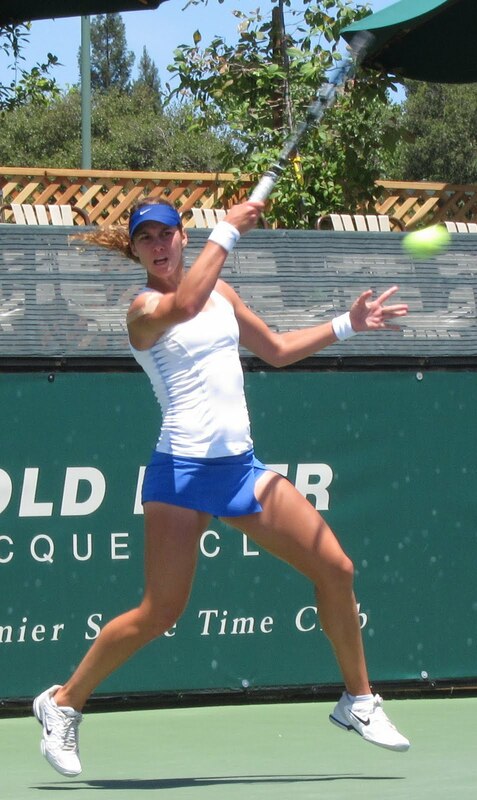 In an effort to draw a better field, the $50,000 tournament at the Gold River River Racquet Club in the Sacramento area will be held four weeks later. The Challenger is scheduled for June 22 to June 29 or 30. The top seed this year was Russia's Elena Bovina, then ranked No. 243 in the world. The last direct acceptance, 17-year-old Samantha Crawford of Tamarac, Fla., was No. 877. The Challenger in El Paso, Texas, the following week attracted a better field despite offering half the prize money. Bovina again was seeded first, but American Whitney Jones was the last direct acceptance at No. 653. The problem for the Gold River Challenger was that it was held during the first week of the French Open. Most players who lost in French Open qualifying then traveled to England to play on grass and prepare for Wimbledon a few weeks later. Next year's Gold River tournament is set for the first week of Wimbledon, but players who lose in qualifying there will head to the United States for the summer hardcourt circuit. Some of them figure to play at Gold River. Also, in an attempt to draw more fans, night matches will be played for the first time. Last year's tournament was sparsely attended as temperatures reached the high 90s and most working people were unable to attend. Organizers are even "shooting for a Saturday night final," Burchett said. In addition, Burchett plans to increase publicity, which was minimal for the inaugural tournament. Fourth-seeded Maria Sanchez of Modesto, 87 miles (140 kilometers) south of Gold River, won the singles title, and second-seeded Asia Muhammad of Henderson, Nev., and Yasmin Schnack of Elk Grove in the Sacramento area took the doubles crown. It was the first professional singles title for the 5-foot-10 Sanchez, who commuted from home throughout the week. In her first full year as a pro, the former USC All-American has soared from No. 687 to No. 127 in the world in singles and from No. 268 to No. 115 in doubles. She will turn 23 on Nov. 26. Muhammad and Schnack played doubles together for the Sacramento Capitals in the World TeamTennis regular season in July and during the league playoffs in September. The Washington Kastles edged Sacramento 20-19 for their second consecutive WTT crown. Mary Laver dies -- Mary Laver, the wife of legend Rod Laver, died Monday at their home in the San Diego suburb of Carlsbad after a long illness, the Associated Press reported. She was 84. Rod, 74, is Australian, and Mary was born in DeKalb, Ill. They were married in San Rafael, across the Golden Gate Bridge from San Francisco, in 1966 and had one child, a son named Rick. Mary had three children from a previous marriage. Rod is the only player, male or female, to win the Grand Slam twice. He accomplished the feat as an amateur in 1962 and as a professional in 1969. Friday -- Davis Cup final, Spain at Czech Republic, singles, Tennis Channel, 7 a.m.-1 p.m. (live), 1-4 p.m. (repeat), 7 p.m.-1 a.m. Saturday (repeat). Saturday -- Davis Cup final, Spain at Czech Republic, doubles, Tennis Channel, 5-8 a.m. (live), 8-11 a.m. (repeat), 5-8 p.m. (repeat). Sunday -- Davis Cup final, Spain at Czech Republic, reverse singles, Tennis Channel, 4-10 a.m. (live), 10 a.m.-1 p.m. (repeat), 5-8 p.m. (repeat). Friday -- BILT Champions Showdown (Andre Agassi, Jim Courier, John McEnroe and Todd Martin), 7:30 p.m., HP Pavilion, San Jose, Calif., www.PowerSharesSeries.com. Friday-Sunday -- Davis Cup Final, Spain at Czech Republic, www.daviscup.com. 2011 champion: Spain. Kevin Anderson, Sacramento Capitals (2012) of World TeamTennis -- No. 36 in singles (no change), No. 89 in doubles (no change). Nick Andrews, Cal All-American in 2012, resident of Folsom in the Sacramento area -- Career-high No. 1,062 in doubles (+2), No. 1,485 in singles (-36). Bob Bryan, 1998 NCAA doubles champion from Stanford -- No. 2 in doubles (no change), unranked in singles. Mardy Fish, Capitals (2012) -- No. 27 in singles (no change), No. 721 in doubles (-4). John Paul Fruttero, Cal All-American in 2001 and 2002 -- No. 120 in doubles (-5), unranked in singles. Artem Ilyushin, resident of Granite Bay in the Sacramento area -- No. 1,153 in singles (-184), No. 1,481 in doubles (-273). Bradley Klahn, 2010 NCAA singles champion and 2011 NCAA doubles runner-up from Stanford -- Career-high No. 260 in singles (+9), No. 678 in doubles (+96). Alex Kuznetsov, Capitals (2012) -- No. 178 in singles (+2), No. 225 in doubles (+71). Scott Lipsky, 2002 NCAA doubles runner-up from Stanford -- No. 25 in doubles (no change), unranked in singles. Sam Querrey, San Francisco native, Capitals (2012) -- No. 22 in singles (no change), No. 45 in doubles (no change). Ryan Sweeting, Capitals (2012) -- No. 147 in singles (+4), unranked in doubles. Ryan Thacher, 2011 NCAA doubles runner-up from Stanford -- No. 783 in doubles (no change), 1,165 in singles (-9). Dmitry Tursunov, Folsom resident -- No. 127 in singles (no change), No. 209 in doubles (-1). Pedro Zerbini, All-Pacific-10 Conference first team at Cal (2009-11) -- Career-high No. 528 in singles (+75), No. 645 in doubles (no change). Mallory Burdette, NCAA singles runner-up in 2012 and NCAA doubles champion in 2011 and 2012 from Stanford -- No. 145 in singles (-3), No. 432 in doubles (+80). Vania King, Capitals (2010-12) -- No. 22 in doubles (no change), No. 70 in singles (no change). Raquel Kops-Jones, 2003 NCAA doubles champion from Cal -- Career-high No. 13 in doubles (no change), No. 1,120 in singles (-4). Asia Muhammad, Capitals (2012) -- No. 162 in doubles (+7), No. 469 in singles (+2). Maria Sanchez, Modesto resident -- No. 115 in doubles (+1), career-high No. 127 in singles (+12). Yasmin Schnack, resident of Elk Grove in the Sacramento area, Capitals (2011-12) -- No. 170 in doubles (-21), No. 552 in singles (-30). Romana Tedjakusuma, Tracy resident -- No. 465 in singles (-1), No. 1,116 in doubles (+1). CoCo Vandeweghe, Capitals (2009, 2012) -- No. 98 in singles (-3), No. 501 in doubles (-8). to win his third consecutive title in the tournament in February. Andy Roddick didn't do it. Nor did Andy Murray, Pete Sampras, Andre Agassi or John McEnroe. Milos Raonic will try to become the first player since Tony Trabert (1953-55) to win the San Francisco Bay Area stop on the men's tour for three years in a row. Organizers recently announced that Raonic, former champions Lleyton Hewitt of Australia and Fernando Verdasco of Spain and the top-ranked doubles team of Bob and Mike Bryan have entered the 2013 SAP Open, Feb. 11-17 at HP Pavilion in San Jose. It will be the 125th and last SAP Open, the second-oldest tennis tournament in the United States. Rio de Janeiro, the site of the 2016 Summer Olympics and a co-host of the 2014 World Cup soccer tournament, will replace San Jose on the ATP World Tour beginning in 2014. Raonic (pronounced Rau-nitch), a 21-year-old Canadian, defeated Verdasco in the 2011 final for his first ATP World Tour title and Denis Istomin of Uzbekistan in last year's championship match. Roddick (2004-05), Murray (2006-07), Sampras (1996-97) and McEnroe (1978-79) each won the Bay Area tournament twice in a row. McEnroe triumphed five times overall, Roddick three and Murray and Sampras twice each. Agassi prevailed five times but never consecutively. Raonic, 6-foot-5 (196 centimeters), is ranked a career-high 13th in the world with three career singles titles. He is 9-0 in singles in San Jose. Hewitt, the 2002 SAP Open champion, plans to return for the sixth time. A likely International Tennis Hall of Famer, the 31-year-old veteran ranks fourth among active players with 28 singles titles. He trails Roger Federer (76), Rafael Nadal (50) and Novak Djokovic (33). Hewitt has won two Grand Slam singles crowns, the U.S. Open in 2001 and Wimbledon in 2002. Ranked No. 1 in 2001, he has plummeted to No. 80. Verdasco, a 28-year-old left-hander, has played in the SAP Open twice. He won it in 2010, becoming the first Spaniard to do so since Manuel Santana in 1964, and fell to Raonic 7-6 (6), 7-6 (5) in the 2011 final. The loss to Raonic was marred by controversy. With Raonic serving on match point, a spectator yelled, and a distracted Verdasco netted the return. Verdasco is ranked 24th after reaching a career-high No. 7 in 2009. The 34-year-old Bryan twins have won 82 career doubles titles, an Open Era record. Twelve have come in Grand Slam tournaments, tying the all-time mark of Australians John Newcombe and Tony Roche from 1965 to 1976. The Bryans also won the Olympic gold medal in men's doubles this summer in London. But they have never won the SAP Open in nine attempts, even though they attended college a few miles up the road at Stanford. They have reached the final only once, losing to former Stanford stars Scott Lipsky and David Martin in 2008. The SAP Open has struggled to attract top players and big crowds in recent years. Roddick's career steadily declined after he won his last SAP title in 2008, and he retired in September, one week after his 30th birthday. No American man has won a Grand Slam singles title since Roddick captured the 2003 U.S. Open for his only major crown. France's Gael Monfils, then ranked 13th in the world, was seeded first in last year's tournament but withdrew with a knee injury. Roddick was second and Raonic third. The final drew an announced crowd of 5,682. The tournament has been held at HP Pavilion, the home of the National Hockey League's San Jose Sharks, since it opened in 1994. That has forced the Sharks to take an extended road trip each February. The event began in Monterey in 1889 and also has been held under various names in Berkeley, San Francisco, Alamo and Daly City. Other past champions include legends Don Budge, Jack Kramer, Rod Laver, Arthur Ashe and Jimmy Connors. Ticket packages and group tickets are available by calling (408) ACE-2121. Individual session tickets will go on sale in January. For more information, visit www.sapopentennis.com. Wednesday -- ATP World Tour Finals, round-robin singles, Tennis Channel, 2-10 p.m. (repeat). Thursday -- ATP World Tour Finals, round-robin doubles, Tennis Channel, 4-5:30 a.m. and 10-11:30 a.m. (live), 8-9:30 a.m. (repeat); round-robin singles, ESPN2, 11 a.m.-1 p.m. (delay), Tennis Channel, 2-10 p.m. (repeat). Friday -- ATP World Tour Finals, round-robin doubles, Tennis Channel, 4-5:30 a.m. and 10-11:30 a.m. (live), 8-9:30 a.m. and 10 p.m.-1 a.m. Saturday (repeat); round-robin singles, ESPN2, 11 a.m.-1 p.m. (delay), Tennis Channel, 2-10 p.m. (repeat). Saturday -- ATP World Tour Finals, round-robin doubles, Tennis Channel, 4-5:30 a.m. and 9:30-11:30 a.m. (live), 8-9:30 a.m., 9:30 p.m.-1 a.m. Sunday (repeat); round-robin singles, Tennis Channel, 5:30-8 a.m. and 11:30 a.m.-1:30 p.m. (live), 1:30-9:30 p.m. (repeat). Sunday -- ATP World Tour Finals, doubles semifinals, Tennis Channel, 4-5:30 a.m. and 10-11:30 a.m. (live); singles semifinals, ESPN2, 6-8 a.m. and 11:30 a.m.-1:30 p.m. (live). Monday -- ATP World Tour Finals, doubles final, Tennis Channel, 10-11:30 a.m. (live); singles final, ESPN2, noon-2 p.m. (live). Through Monday -- ATP World Tour Finals (top eight singles players and top eight doubles teams of 2012), London, www.atpworldtour.com/Finals/2012.aspx. 2011 champions: Roger Federer, Max Mirnyi-Daniel Nestor. Saturday -- Sacramento Clay Court League semifinals, 10 a.m., 8725 Hammersmith Lane, Fair Oaks, Calif., 95628, www.sacramentoclaycourtleague.com. Sunday -- Sacramento Clay Court League final, noon, 8582 Westin Lane, Orangevale, Calif., 95662, www.sacramentoclaycourtleague.com. Nov. 16 -- BILT Champions Showdown (Andre Agassi, Jim Courier, Ivan Lendl and John McEnroe), 7:30 p.m., HP Pavilion, San Jose, Calif., www.PowerSharesSeries.com. Nov. 16-18 -- Davis Cup Final, Spain at Czech Republic, www.daviscup.com. 2011 champion: Spain. Kevin Anderson, Sacramento Capitals (2012) of World TeamTennis -- No. 36 in singles (+3), No. 89 in doubles (-14). Nick Andrews, Cal All-American in 2012, resident of Folsom in the Sacramento area -- Career-high No. 1,064 in doubles (+3), No. 1,449 in singles (-4). Bob Bryan, 1998 NCAA doubles champion from Stanford -- No. 2 in doubles (-1), unranked in singles. Mardy Fish, Capitals (2012) -- No. 27 in singles (-1), No. 717 in doubles (+6). John Paul Fruttero, Cal All-American in 2001 and 2002 -- No. 115 in doubles (-7), unranked in singles. Artem Ilyushin, resident of Granite Bay in the Sacramento area -- No. 969 in singles (-59), No. 1,208 in doubles (+1). Bradley Klahn, 2010 NCAA singles champion and 2011 NCAA doubles runner-up from Stanford -- Career-high No. 269 in singles (+22), No. 774 in doubles (-1). Mark Knowles, Capitals (2001-07, 2009-12), three-time World TeamTennis Male MVP (2001, 2005 and 2007) -- No. 127 in doubles (+2), unranked in singles. Alex Kuznetsov, Capitals (2012) -- No. 180 in singles (+37), No. 296 in doubles (+46). Scott Lipsky, 2002 NCAA doubles runner-up from Stanford -- No. 25 in doubles (+2), unranked in singles. Sam Querrey, San Francisco native, Capitals (2012) -- No. 22 in singles (+1), No. 45 in doubles (+2). Ryan Sweeting, Capitals (2012) -- No. 151 in singles (-3), unranked in doubles. Ryan Thacher, 2011 NCAA doubles runner-up from Stanford -- No. 783 in doubles (-2), career-high 1,156 in singles (+55). Dmitry Tursunov, Folsom resident -- No. 127 in singles (-3), No. 208 in doubles (+23). Pedro Zerbini, All-Pacific-10 Conference first team at Cal (2009-11) -- Career-high No. 603 in singles (+6), No. 645 in doubles (+5). Mallory Burdette, NCAA singles runner-up in 2012 and NCAA doubles champion in 2011 and 2012 from Stanford -- No. 142 in singles (-3), No. 512 in doubles (-3). Raquel Kops-Jones, 2003 NCAA doubles champion from Cal -- Career-high No. 13 in doubles (no change), No. 1,116 in singles (-2). Asia Muhammad, Capitals (2012) -- No. 169 in doubles (-2), No. 471 in singles (-1). Maria Sanchez, Modesto resident -- Career-high No. 108 in doubles (+1), career-high No. 139 in singles (+10). Yasmin Schnack, resident of Elk Grove in the Sacramento area, Capitals (2011-12) -- No. 149 in doubles (no change), No. 522 in singles (-4). Romana Tedjakusuma, Tracy resident -- No. 464 in singles (+61), No. 1,117 in doubles (+2). CoCo Vandeweghe, Capitals (2009, 2012) -- No. 95 in singles (-2), No. 493 in doubles (-5). Unseeded Sam Querrey could not sustain his momentum in the BNP Paribas Masters. Querrey, a 25-year-old San Francisco native and part-time member of the Sacramento Capitals in World TeamTennis this year, lost to 32-year-old French wild card Michael Llodra 7-6 (4), 6-3 Friday in the quarterfinals in Paris, Llodra's hometown. Querrey, who fell to 0-2 lifetime against Llodra, had knocked off second-seeded Novak Djokovic in the second round and 14th-seeded Milos Raonic in the third round. There could be an all-French final for the first time since the tournament began in 1968, although the odds are against it. Unseeded Gilles Simon of France will face qualifier Jerzy Janowicz of Poland in the first semifinal today at 2:30 p.m. Paris time (6:30 a.m. in California), followed by Llodra, a three-time Grand Slam doubles champion, against fourth-seeded David Ferrer of Spain not before 5 p.m. (9 a.m. in California). Tennis Channel will televise both matches live and repeat them from 3:30 to 8:30 p.m. PDT. The 6-foot-8 (203-centimeter) Janowicz, 21, has ousted four consecutive top-20 players: No. 19 Philipp Kohlschreiber of Germany, No. 15 Marin Cilic of Croatia, No. 3 Andy Murray of Great Britain and No. 9 Janko Tipsarevic of Serbia. The BNP Paribas Masters final has featured at least one French player for the past four years. Jo-Wilfried Tsonga was the last one to win it, in 2008. Gael Monfils was the runner-up the following two years, and Tsonga lost to Roger Federer in last year's final. Federer withdrew from this year's tournament to rest nagging injuries before next week's ATP World Tour Finals in London. The field consists of the top eight singles players and top eight doubles teams of the year. Jerzy Janowicz fell to the court, held his head in his hands and wept as if he had just won Wimbledon. The 21-year-old Polish qualifier actually had saved a match point and shocked third-ranked Andy Murray, this year's U.S. Open and Olympic champion, 5-7, 7-6 (4), 6-2 Thursday in the third round of the BNP Paribas Masters in Paris. "This was the most unbelievable day in my life," the 6-foot-8 Janowicz told reporters. "I beat Olympic champion, U.S. Open champion. Unbelievable feeling for me. Still, I have feeling like in few minutes I'm going to wake up and it's going to be everything gone. "I don't know actually what I supposed to say because it's really hard to describe this feeling. It's not easy for me to talk about this week, because I had really tough moments in my life. This is like a movie for me." Janowicz's parents, former professional volleyball players, sold shops and apartments they owned to help his career. "I'm from Poland, and I know it's not easy to become professional tennis player," he said. "Actually, I have problem with sponsors. I was fighting my whole life with money, so this week is really important for me to get some sponsors, to get some help." Janowicz is ranked 69th after beginning the year at No. 221. He has beaten three top-20 players in the BNP Paribas Masters -- No. 19 Philipp Kohlschreiber, No. 15 Marin Cilic and No. 3 Murray -- and will meet No. 9 Janko Tipsarevic of Serbia in today's quarterfinals. The match will begin at about 4 p.m. Paris time (8 a.m. California time, Tennis Channel). Murray, 25, won the first two of his 24 career singles titles at the 2006 and 2007 SAP Open in San Jose. His loss in Paris leaves the tournament with none of the Big Four. No. 1 Roger Federer withdrew to rest for next week's ATP World Tour Finals in London. No. 2 Novak Djokovic fell to Sam Querrey on Wednesday, and No. 4 Rafael Nadal has been out with knee tendinitis since losing in the second round of Wimbledon to Lukas Rosol. Querrey, a 25-year-old San Francisco native and part-time member of the Sacramento Capitals of World TeamTennis this year, beat 14th-seeded Milos Raonic 6-3, 7-6 (1). Raonic, 21, will seek his third straight SAP Open singles crown in February, when the tournament will be held for the 125th and last time before moving to Rio de Janeiro. Querrey will face Michael Llodra, a 32-year-old French wild card, today at about 9:30 p.m. Paris time (1:30 p.m. California time). Lodra upset seventh-seeded Juan Martin del Potro, the 2009 U.S. Open champion coming off titles in Vienna and Basel in the previous two weeks, 6-4, 6-3. Del Potro toppled Federer, the hometown favorite, in the Basel final to snap a seven-match losing streak to the Swiss star. Del Potro also victimized Federer for his only Grand Slam title. In doubles, Paul Hanley and Wimbledon champion Jonathan Marray surprised top-ranked Bob and Mike Bryan, former NCAA champions from Stanford, 6-4, 6-7 (2), 10-5 tiebreak to reach the quarterfinals. The 34-year-old Bryan twins won the Paris title in 2005 and 2007. Capitals -- Kolleen McNamee has been named the general manager of the Capitals, the team announced. McNamee, formerly the athletic director at St. Francis High School in Sacramento, has been involved in sports as a player, coach or adminstrator for 35 years. She played soccer at Cal Poly in San Luis Obispo and was inducted in the school's Hall of Fame in 2004. McNamee replaces Jayna Osborne, the wife of 74-year-old Capitals co-owner Ramey Osborne. Jayna took over in June after 28-year-old Matt McEvoy left to run the Frys.com Open, a PGA Tour event in the Silicon Valley. The Capitals have won a record six WTT titles, most recently in 2007. They lost to the Washington Kastles in this year's WTT Finals, 20-19. Querrey stuns Djokovic; new TV schedule, etc. All Sam Querrey wanted was to win two games. He did a bit better than that, pulling off the biggest victory of his career. Querrey, a 25-year-old San Francisco native and part-time member of the Sacramento Capitals in World TeamTennis this season, lost the first eight games to second-ranked Novak Djokovic but recovered to win 0-6, 7-6 (5), 6-4 Wednesday in the second round of the BNP Paribas Masters in Paris. It was Querrey's first victory over a top-10 player in 12 months. He defeated Frenchman Jo-Wilfried Tsonga, then ranked eighth, in the second round at Valencia. Querrey, who fell to No. 125 in September last year after undergoing surgery for bone spurs in his right elbow, has fought back to No. 23. He's threatening to surpass his career high of No. 17 in January last year. Three years ago, Querrey suffered a season-ending right forearm injury when he sat on a glass table at a tournament in Bangkok to tie his shoes and the table shattered. A deep cut narrowly missed damaging nerves, which could have ended his career. Djokovic, the 2009 Paris champion, blitzed Querrey in 20 minutes in the opening set and bolted to a 2-0 lead in the second set. Querrey pounded 18 aces in the match and saved six of 10 break points. "Sam played very well, served very well," said Djokovic, who entered Court Central wearing a Darth Vader mask on Halloween. Querrey, 6-foot-6, will face 14th-seeded Milos Raonic, a 6-foot-5 Canadian, on Thursday at about 5:30 p.m. Paris time (9:30 a.m. in California) on Tennis Channel. The 21-year-old Raonic, who will seek his third straight SAP Open title in San Jose in February, defeated Jeremy Chardy of France 6-7 (4), 7-6 (4), 6-3. Querrey beat Raonic 6-7 (3), 7-6 (7), 7-6 (8), 6-4 in the second round at Wimbledon this year in their only career meeting. Thursday -- Paris (men), early rounds, Tennis Channel, 2:30 a.m.-3 p.m. (live), 3 p.m.-3 a.m. Friday (repeat). Friday -- Paris (men), quarterfinals, Tennis Channel, 6-10 a.m. (live), 11:30 a.m.-3:30 p.m. (live), 4 p.m.-midnight (repeat). Saturday -- Paris (men), semifinals, Tennis Channel, 6:30-11:30 a.m. (live), 3:30-8:30 p.m. (repeat). Fed Cup final, Serbia at Czech Republic, opening singles matches, Tennis Channel, 11:30 a.m.-3:30 p.m. (delay). Sofia Tournament of Champions (women), semifinals, Tennis Channel, 8:30-11:30 p.m. (delay). Sunday -- Paris (men), final, Tennis Channel, 6-8:30 a.m. (live), 2:30-5 p.m. (repeat), 6-8:30 p.m. (repeat). Fed Cup final, Serbia at Czech Republic, reverse singles matches and one doubles match, Tennis Channel, 8:30 a.m.-2:30 p.m. (delay). Sofia Tournament of Champions (women), final, 8:30-10:30 p.m. (delay). Saturday-Sunday -- Fed Cup Final, Serbia at Czech Republic, www.fedcup.com. 2011 champion: Czech Republic. Nov. 5-12 -- ATP World Tour Finals (top eight singles players and top eight doubles teams of 2012), London, www.atpworldtour.com/Finals/2012.aspx. 2011 champions: Roger Federer, Max Mirnyi-Daniel Nestor. Nov. 11 -- Sacramento Clay Court League final, noon, 8582 Westin Lane, Orangevale, Calif., 95662, www.sacramentoclaycourtleague.com. Kevin Anderson, Sacramento Capitals (2012) of World TeamTennis -- No. 39 in singles (no change), career-high No. 75 in doubles (+6). Nick Andrews, Cal All-American in 2012, resident of Folsom in the Sacramento area -- Career-high No. 1,067 in doubles (+2), No. 1,445 in singles (-4). Mardy Fish, Capitals (2012) -- No. 26 in singles (no change), No. 723 in doubles (+1). John Paul Fruttero, Cal All-American in 2001 and 2002 -- No. 108 in doubles (+1), unranked in singles. Artem Ilyushin, resident of Granite Bay in the Sacramento area -- No. 910 in singles (-1), No. 1,209 in doubles (-6). Bradley Klahn, 2010 NCAA singles champion and 2011 NCAA doubles runner-up from Stanford -- Career-high No. 291 in singles (+1), No. 773 in doubles (-5). Mark Knowles, Capitals (2001-07, 2009-12), three-time World TeamTennis Male MVP (2001, 2005 and 2007) -- No. 129 in doubles (-1), unranked in singles. Alex Kuznetsov, Capitals (2012) -- No. 217 in singles (+12), No. 342 in doubles (+12). Scott Lipsky, 2002 NCAA doubles runner-up from Stanford -- No. 27 in doubles (+2), unranked in singles. Sam Querrey, San Francisco native, Capitals (2012) -- No. 23 in singles (no change), No. 47 in doubles (no change). Ryan Sweeting, Capitals (2012) -- No. 148 in singles (-2), unranked in doubles. Ryan Thacher, 2011 NCAA doubles runner-up from Stanford -- No. 781 in doubles (-4), 1,211 in singles (-7). Dmitry Tursunov, Folsom resident -- No. 124 in singles (-5), No. 231 in doubles (-3). Pedro Zerbini, All-Pacific-10 Conference first team at Cal (2009-11) -- No. 609 in singles (-1), No. 650 in doubles (-6). Mallory Burdette, NCAA singles runner-up in 2012 and NCAA doubles champion in 2011 and 2012 from Stanford -- Career-high No. 139 in singles (+5), No. 509 in doubles (+146). Vania King, Capitals (2010-12) -- No. 22 in doubles (no change), No. 70 in singles (-1). Raquel Kops-Jones, 2003 NCAA doubles champion from Cal -- Career-high No. 13 in doubles (no change), No. 1,114 in singles (+6). Asia Muhammad, Capitals (2012) -- No. 167 in doubles (+1), No. 470 in singles (no change). Maria Sanchez, Modesto resident -- No. 109 in doubles (-1), No. 149 in singles (+2). Yasmin Schnack, resident of Elk Grove in the Sacramento area, Capitals (2011-12) -- No. 149 in doubles (-1), No. 518 in singles (-3). Romana Tedjakusuma, Tracy resident -- No. 525 in singles (-7), No. 1,119 in doubles (+3). CoCo Vandeweghe, Capitals (2009, 2012) -- No. 93 in singles (-2), No. 488 in doubles (-2). Today -- WTA Championships, Istanbul, doubles semifinal, Tennis Channel, 3-4:30 a.m. (live); singles semifinals 5-9 a.m. (live); doubles semifinal, 9-10:30 a.m. (live); 10:30 a.m.-2:30 p.m., singles semifinals (repeat). Basel (men), semifinals, Tennis Channel, 2:30-7:30 p.m. (delay). Valencia (men), semifinals, Tennis Channel, 7:30 p.m.-12:30 a.m. Sunday (delay). Sunday -- WTA Championships, Istanbul, doubles final, Tennis Channel, 5:30-7 a.m. (live), 2:30-4 p.m. (repeat); singles final, ESPN2, 11 a.m.-1 p.m. (live), Tennis Channel, 5-9 p.m. (repeat). Basel (men), final, Tennis Channel, 7-9:30 a.m. (delay), noon-2:30 p.m. (repeat). Valencia (men), final, Tennis Channel, 9:30 a.m.-noon (delay). Through Sunday -- WTA Championships (top eight singles players and top four doubles teams of 2012), Istanbul, www.wtatennis.com/page/Tournaments/Info/0,,12781~742,00.html. 2011 champions: Petra Kvitova, Liezel Huber-Lisa Raymond. Nov. 3-4 -- Fed Cup Final, Serbia at Czech Republic, www.fedcup.com. 2011 champion: Czech Republic. Jan. 15 -- Sacramento State men at Stanford in spring season opener for both teams, 1:30 p.m.
Jan. 18 -- Stanford women open spring season at Freeman Invitational in Las Vegas and at NCTC Classic in Indian Wells, Calif., times TBA. UC Davis women open spring season vs. Northern Arizona in Tempe, Ariz., 1 p.m.
Jan. 19 -- UC Davis men at Santa Clara in spring season opener for both teams, 10 a.m.
Feb. 1 -- Sacramento State women open spring season at Arizona, 12:30 p.m.
April 26-28 -- Big Sky Conference men's and women's tournament, Gold River Racquet Club, Gold River, Calif.
Kevin Anderson, Sacramento Capitals (2012) of World TeamTennis -- No. 39 in singles (-1), career-high No. 81 in doubles (+5). Nick Andrews, Cal All-American in 2012, Folsom resident -- No. 1,441 in singles (+5), No. 1,069 in doubles (+1). Mardy Fish, Capitals (2012) -- No. 26 in singles (no change), No. 724 in doubles (no change). John Paul Fruttero, Cal All-American in 2001 and 2002 -- No. 109 in doubles (no change), unranked in singles. Bradley Klahn, 2010 NCAA singles champion and 2011 NCAA doubles runner-up from Stanford -- Career-high No. 292 in singles (+1), No. 768 in doubles (+2). Mark Knowles, Capitals (2001-07, 2009-12), three-time World TeamTennis Male MVP (2001, 2005 and 2007) -- No. 128 in doubles (no change), unranked in singles. Scott Lipsky, 2002 NCAA doubles runner-up from Stanford -- No. 29 in doubles (no change), unranked in singles. Sam Querrey, San Francisco native, Capitals (2012) -- No. 23 in singles (-1), No. 47 in doubles (-1). Ryan Thacher, 2011 NCAA doubles runner-up from Stanford -- Career-high No. 1,204 in singles (+6), No. 777 in doubles (no change). Dmitry Tursunov, Folsom resident -- No. 119 in singles (-14), No. 228 in doubles (-1). Pedro Zerbini, All-Pacific-10 Conference first team at Cal (2009-11) -- Career-high No. 608 in singles (no change), No. 644 in doubles (-1). Mallory Burdette, NCAA singles runner-up in 2012 and NCAA doubles champion in 2011 and 2012 from Stanford -- No. 145 in singles (-1), No. 655 in doubles (-2). Vania King, Capitals (2010-12) -- No. 22 in doubles (-4), No. 69 in singles (+3). Raquel Kops-Jones, 2003 NCAA doubles champion from Cal -- Career-high No. 13 in doubles (+2), No. 1,120 in singles (+3). Asia Muhammad, Capitals (2012) -- No. 168 in doubles (no change), No. 470 in singles (+3). Maria Sanchez, Modesto resident -- Career-high No. 108 in doubles (no change), No. 151 in singles (no change). Yasmin Schnack, Elk Grove resident, Capitals (2011-12) -- No. 148 in doubles (+1), No. 515 in singles (no change). Romana Tedjakusuma, Tracy resident -- No. 518 in singles (no change), No. 1,122 in doubles (+2). CoCo Vandeweghe, Capitals (2009, 2012) -- No. 91 in singles (+2), No. 486 in doubles (-2). Class act -- James Blake won more than the singles trophy in Sacramento. The former world No. 4 also won many friends with his sportsmanship and politeness. Most notably, the seeded-second Blake conceded a point in his 4-6, 6-3, 6-1 victory over qualifier Taro Daniel of Japan in the first round. With Daniel serving at 15-30 in the first game of the second set, Blake appeared to win the point when Daniel hit a lob long. But Blake notified the chair umpire that he had nicked the ball with his racket. Otherwise, no one would have known. Throughout the week, Blake said "Too good" when opponents hit passing shots and thanked ballboys and ballgirls for giving him balls. On the rare occasions when Blake made a bad error, he didn't yell, belt a ball into the next county or smash his racket to smithereens. He simply admonished himself by muttering "James" in a disappointed tone like a father to his son for neglecting to take out the trash. The oldest player in the singles draw, Blake will turn 33 on Dec. 28. He hopes to play for another year or more. Whenever he retires, it will be a sad day. International intrigue -- Daniel, the youngest player in the singles draw at 19, has an unusual background. He was born in New York, grew up in Japan, lives in Spain and visits Santa Cruz in Northern California every year. Daniel's father, a financial manager for TRW Automotive in Spain, is from Santa Cruz, and his mother is Japanese. Consummate pro -- Rik de Voest, who won the singles title of the inaugural (2005) Sacramento Challenger and the doubles crown in Tiburon last week (with Chris Guccione), is a throwback. He wins with guile rather than power, volleys deftly and, like Blake, conducts himself professionally. Only 5-foot-11 (180 centimeters) and 150 pounds (68 kilograms), de Voest compensates for his lack of power with mental toughness, craftiness and consistency. The 32-year-old South African keeps the ball in play until 1) his opponent makes an error or 2) he can pound the ball into a corner and come to the net for a putaway volley. He is ranked No. 185 in singles (career-high No. 110 in 2006) and No. 131 in doubles (career-high No. 36 in 2009). De Voest had no business beating Rhyne Williams in the first round in Sacramento yet prevailed 5-7, 7-6 (3), 6-4 in 3 hours, 13 minutes. Williams served for the match at 5-4 in the second set and led 4-1 (one service break) in the third set. Williams, 21, is a prototypical young American. He has size -- 6-foot-1 (185 centimeters) and 177 pounds (80 kilograms) -- a big serve and forehand, and a volatile temper. While de Voest kept his cool in the match, Williams went ballistic. After de Voest hit a topspin lob to break for 5-4 in the third set, Williams smashed his racket on the court three times and was assessed a point penalty. Earlier, Williams had received a warning for pounding a ball over the fence. Fan-demonium -- Players often argue with the chair umpire. But with a spectator? It happened at the Natomas Racquet Club in Sacramento during Tennys Sandgren's 6-4, 6-3 second-round victory over Matt Reid of Australia. Sandgren, a 21-year-old American who won the doubles title with ex-University of Tennessee teammate Williams, complained to the chair umpire about not informing him that new balls were being used. "Yes, he did," spectator Bob Martinez, the junior tennis coordinator at the Gold River Racquet Club in the Sacramento area, told Sandgren. "Everybody heard him. You're complaining about everything. Just play ball." "Who are you?" Sandgren shot back. "Just a spectator," Martinez said. "That's all you need to say," Sandgren replied. After the match, Sandgren approached Martinez, and they cordially discussed the incident. "It wasn't just the balls," Martinez said later. "It was everything. He was yelling at the ballkids to move over faster. They were freaking out. It really bothered me because I work with kids. I would have regretted it if I hadn't said anything." Yankee Doodle Dandies -- Sacramento and Tiburon fans likely have witnessed the next generation of U.S. Davis Cup players. The front-runners to succeed John Isner, 27, and Sam Querrey, 25, in singles appear to be 62nd-ranked Ryan Harrison and No. 165 Jack Sock, both 20. Harrison reached the final of the Tiburon Challenger in 2010, and Sock won it last week. Sock already has won two U.S. Open titles, boys singles in 2010 and mixed doubles (with Melanie Oudin) last year. The top-ranked doubles team of Bob and Mike Bryan, 34-year-old identical twins, could play for another five years. Ironically, another pair of brothers, Ryan and Christian Harrison (18), might succeed them. In only their second pro tournament together, they stunned fourth seeds and reigning finalists Mariusz Fyrstenberg and Marcin Matkowski of Poland en route to the quarterfinals of the U.S. Open last month. Christian lost in the first round of singles in last year's Sacramento Futures. He did not play doubles in the tournament at the Park Terrace Swim & Tennis Club. Also in the doubles mix are Sandgren and Williams, and the Sacramento runners-up, Devin Britton (21) and Austin Krajicek (22). After the All-American doubles final, the Tiburon title match was an all-foreign affair. De Voest and Australia's Guccione, seeded fourth, beat second-seeded Jordan Kerr of Australia and Andreas Siljestrom of Sweden 6-1, 6-4.